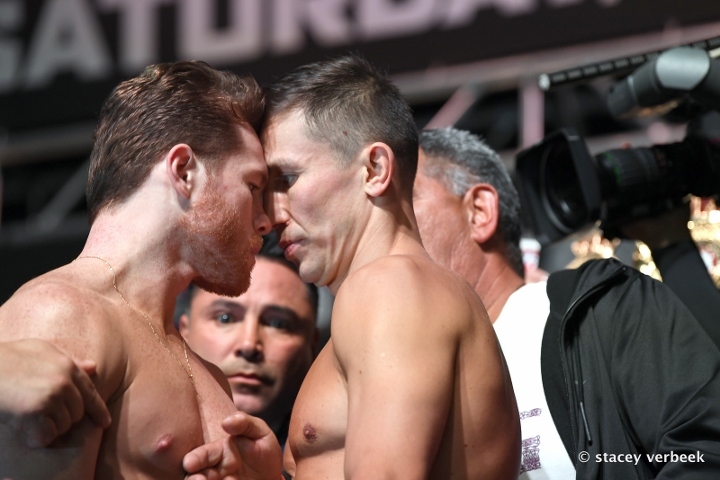 Over the weekend, Golden Boy Promotions CEO Oscar De La Hoya directed his company president, Eric Gomez, to begin immediate negotiations to stage a trilogy encounter between Saul “Canelo” Alvarez and Gennady Golovkin. Canelo, who De La Hoya promotes, is scheduled to return to the ring on May 4th, Cinco De Mayo weekend, at the T-Mobile Arena in Las Vegas – the venue where they collided on two previous occasions. Golovkin has been inactive since lost a close twelve round majority decision to Canelo back in September 2018. The victory awarded Canelo the WBC, WBA middleweight titles. Golovkin (38-1-1, 34KOs) and Canelo (51-1-2, 35 KOs) first met in September of 2017, which resulted in a controversial twelve round split draw. They were initially scheduled to have a rematch in May 2018 – but it was pushed back when Canelo tested positive for the banned substance clenbuterol, which resulted in a six month suspension. Golovkin would instead face, and stop, late-replacement Vanes Martirosyan. De La Hoya doubled down on his plan to make the trilogy, after sitting down with ESPN Radio in Houston. “Last night I had preliminary talks with Golovkin’s people. We threw it out there about fighting for the third time on Cinco de Mayo, which is the biggest weekend in boxing in Las Vegas,” De La Hoya said. But Gomez indicates that Golovkin is not exactly eager to do a third fight at the moment. Looks like [Golovkin] does not want Canelo anymore. Prefers easy [fights] as before. We will see friends,” Gomez stated on social media. After their rematch, both boxers became network free agents after HBO made a company decision to drop eliminate boxing from their programming future. Canelo would eventually sign a five year exclusive deal with streaming service DAZN – and then returned to the ring on December 15th at New York’s Madison Square Garden. He moved up to the super middleweight division and captured the WBA “regular” title with a rapid three round knockout of Rocky Fielding. Golovkin is still a network free agent, with Premier Boxing Champions, DAZN and ESPN all attempting to sign him up. Reportedly, PBC has made the strongest offer of the three. Golovkin has not made any comments regarding his future.